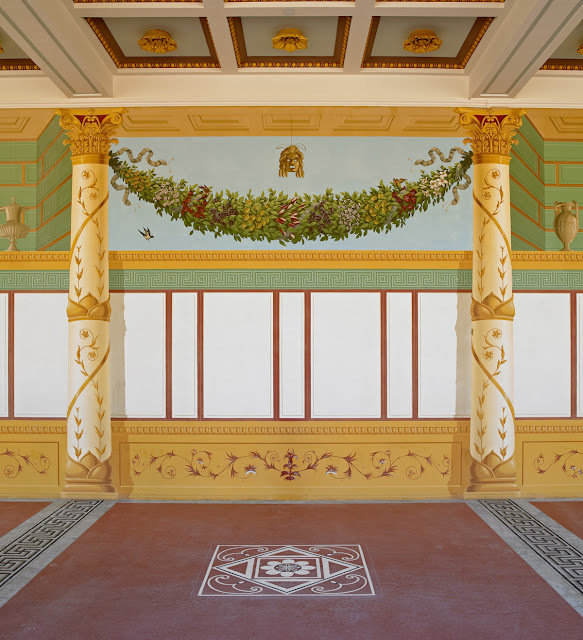 This week I was saddened to learn of the passing of a great muralist, Mr. Garth Benton, an internationally recognized artist who was well known for his stylish first-century style trompe l'oeil decoration of the magnificent Getty Villa in Malibu, California. Mr. Benton "died a after with battle cancer" in May of 2012. I am surprised I did not see it reported anywhere and I only figured it out after I noticed that his website had gone down and began making inquiries. Being a pre-internet personality Mr. Benton was not widely mentioned on the web, but his work was nevertheless world-class, and very well-known in its day. I had the pleasure of working on a project with Garth Benton many years ago when he came to San Francisco to paint some spectacular Chinoiserie murals in a private residence here. He had arrived in town with inexplicably blank wallpaper apparently intending to paint the murals on site, but with no help and nowhere near enough time. I got a desperate call from the wallpaper hanger (who knew I also paint in this style) and rather than ask what the heck had gone wrong, out of respect for this great master painter I put my nearly entire studio at Mr. Benton's disposal - scaffolding, buckets, tarps, ladders, brushes, and as many assistants as I could round up - and we all learned a lot from him while helping him complete his commission, some of the crew often working until 3 AM or even all night, trying to meet the deadline. While we painted, we were regaled with entertaining stories about his many celebrity clients and amazing jobs he'd done over the years. It was exhausting and exciting and the job was truly beautiful. 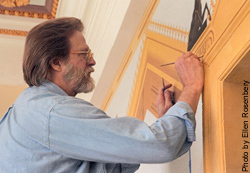 A couple of years later Mr. Benton made headlines for suing his clients, Ann and Gordon Getty, for having painted over one of his older murals in their San Francisco home, which he had hoped to photograph for a glossy catalogue raisonné of his work. The mural had been painted on canvas and could easily have been removed, but the Gettys had not realized this when they redecorated, and had to settle a large amount of money on him for the error. While I felt deeply over the heartbreaking loss of the artwork, the case made me cringe: suing an otherwise supportive client likely didn't help his future business. The mural is still gone and the book was never published. We exchanged a few emails over the years, but regrettably never did get to meet again. So I offer this short tribute to Mr. Garth Benton, to be remembered for his fine work, and his influence on a generation of muralists. I met Garth in '89 or 90 around the time I first moved to CA. We were both published in the same Rizzoli book which is how I knew about him so I looked him and paid him a visit. Garth was very nice but the thing that really made an impression on me was him telling me he was married to Rosamond whose paintings made into posters were ubiquitous in the 70s. Best post yet. I wish I could have met him, but the anecdotes are fantastic and will have to do. 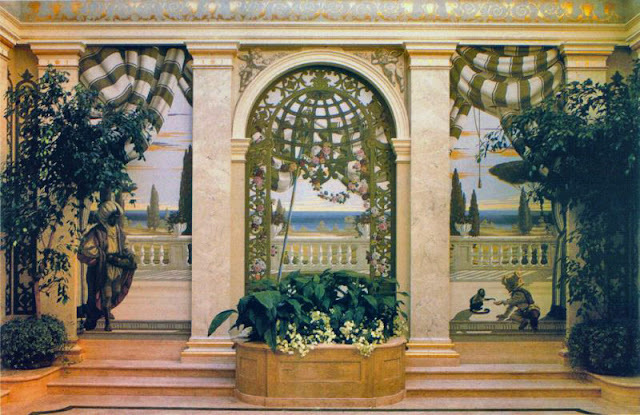 I have always admired Garth Benton's exquisite murals at the Getty Museum, but was not familiar with his other work, including the gorgeous Chinoiserie mural that you've featured here. I wish he could have published that book. Maybe his daughter can carry on that effort. It's a book I would love to have. Garth could and did paint in just about any style so the breadth of his work was really something. Thank you so much Lynne for this tribute. The fact that you met him and worked with him has to be special to you. I will cross my fingers that the daughter will see the importance of his work and carry on with the book. I worked with Garth and Christine (Rosamond) in the late 80's in their Carmel gallery. They were lovely to work for - warm and gracious, down to earth, and wonderfully entertaining -- and I was so disappointed that things didn't work out for them. thanks for your comment. Glad to hear you knew them when they were happy. What a fabulous post!! The time spent working together in your studio working all hours to meet the deadline, sounds like pure heaven! I had two Rosamond prints when I was young and so loved them. In my 30's, during one of my redecorating phases, a good friend talked me out of them only to let his wife get rid of them a couple of years later! Last year my Aunt graciously gave me a small one she has had since they were first sold. It is one of my treasured pieces. I had no idea these two people were related. Thanks Lynne for not only the great fun factor here but the education as well. I just learned today (11/2/13) of Garth Benton's death. Needless to say I was profoundly shocked after such a passage of time. Thank you, Lynne for writing such a graceful and informative post. My wife and I worked with Garth for the first time in the late 1980's. Needless to say, I was in awe of the man I knew by reputation from his work at the Getty Villa (in the same way as I was in awe of Larry Boyce and Bruce Bradbury--all of whom were instrumental in inspiring me to take up my own decorative work). Garth was kind, helpful, funny, inspiring and completely unpretentious in sharing any help or information he could offer. 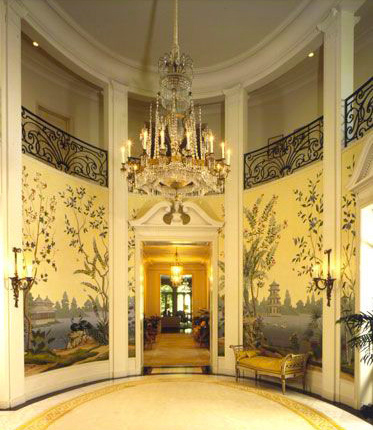 I last had the pleasure of working with he and his daughter, Drew, in 2009 on a residence where he created several grand spaces worthy of Villa Vizcaya. I do hope that his dear and very talented daughter finds a way to produce the book that would be a legacy and record of Garth's incredible work. Thanks for commenting Ed! I also worked with Larry Boyce the last couple of years of his life, which put me int he way of many people who are now close friends and colleagues. I've been very lucky with the level of mentorship in my past and I think these guys really influenced the way I work as well as my teaching style, and I owe my success in some part to their openness and fearlessness. I hope a book about Garth Benton's work happens someday soon, too. It may not be my place to say, but I think Garth really deserves a place in the history of decor in this country. What better way to assure that then with a big glossy book! Sweet, Lynne. I so agree. And may I add that I am looking forward to putting a book about your own glorious contributions to decorative art on my shelf one day! 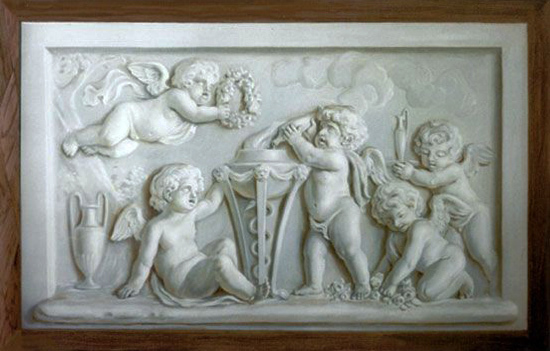 The Ornamentalist is such a huge enjoyment and blessing for us all! I was lucky to have Garth Benton pass through my life in the late 1990's. He had moved to Headland, Al for a respite from California life. We met in my antique shop and he subsequently painted many things in a new home we were building at the time. Being on the board of our local museum, the Wiregrass Museum of Art, we arranged for an exhibition of Garth's works. I am sure that I am the most anonymous person he ever worked with. We remained close friends until his sad death. In our last telephone conversation I told him that I thank God every day that he passed through my life and left a legacy of beauty in my home. As with lots of artists, he will not be fully appreciated during his life. Wow, Mary I am so happy for you having Garth's work in your home! When I was working with him here in SF he had only just moved to Alabama, and he seemed so happy about living there.